Okay, okay, so here is the scoop. As far as senior entertainment goes, I did not like the Coors Brewery Tour. I give it a score of 3.5 out of 10. I know the brewery is a landmark of Golden, Colorado, and tourists come from all over just to see the birthplace of Coors. 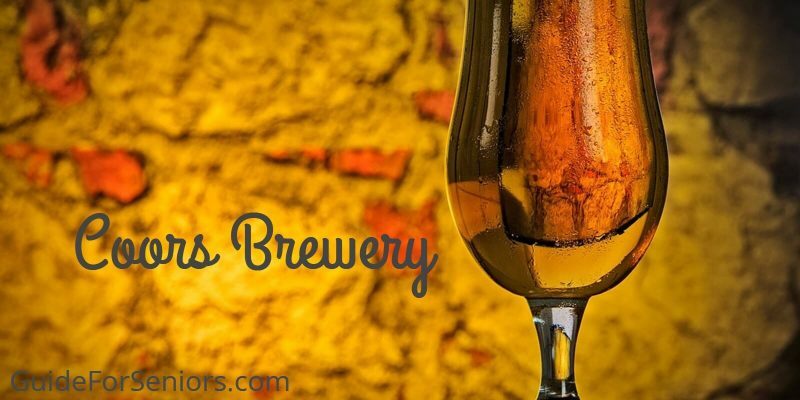 After all, it is the world’s third-largest brewing company. I know it is the thing in Golden, just not for me. I prefer to sit down with a great novel than stand in line for the tour. To tour the brewery, start on 13th and Ford Street in Golden. There is plenty of parking. The gates to the parking lot close at 4. As long as you are in the lot before it closes, you can take the tour. The tour ends in the tasting room and you are entitled to three 8oz glasses of beer. 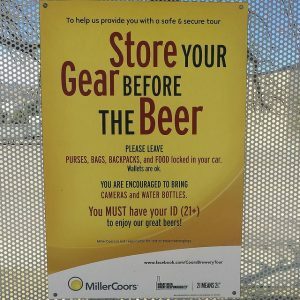 After locking your valuables in the car, you walk to the area where the tour begins They request you leave all purses, bags, fanny packs, and backpacks in your car. You can take your wallet, coat and water bottles with you into the manufacturing plant. If there are 2 lines in the pickup area, you can count on waiting at least an hour. When you finally get to the front of the line, the tour bus will pick you up and your tour will begin. It is a self-directed tour with an audio guide. They predict that it will take about 30 minutes to complete the tour. After entering the Coors Brewery, your picture is taken. It is available at the end of the tour. The tour is well marked and there is no way you can get lost. At one of the first stops, you see the ingredients of beer. Obviously, too many individuals have snatched the wheat, rice, oats, and rye as the buckets are covered with plexiglass. No touching allowed, you can only look. There are murals and pictures of the plant throughout the tour. You can see a picture of Adolph Coors, the head of the family that founded Coors Brewing Company. He and his family have carried on the tradition of the Coors since 1873. In the 70’s, Coors invented the aluminum can. He declined to patent his invention as he wanted it to be the standard of all cans for the future. He could foresee that tin cans were part of a bygone era and a new can was needed to keep up with the increasing demand for beer. During WWII the Coors plant remained open. The US army helped to support the brewery. Half of the beer produced at the plan was sold to the military during the war so the soldiers would not have to do without. Another interesting fact is how the popular silver bullet beer got its name. According to this version, the daughter of Coors was away at school and had a silver can of the beer. Her friends said it looked like a silver bullet. She told her Dad and the rest is history. During the tour, you can see large copper cisterns the beer is mixed in. However, the most interesting room is the bottling room. 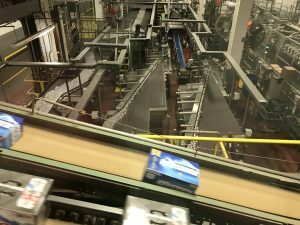 Hundreds of cans are being filled with beer and moved along a conveyer belt. In one location the boxes are opened and the cans fill up the cases. They are then transported along another conveyer belt to the end of the line where a waiting truck is filled. 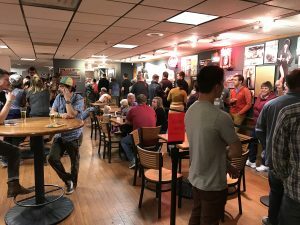 Of course, most of the excitement is in the tasting room. Your wristband is marked as you obtain your 3 glasses of beer, one at a time. The menu consists of a total of 5 beers from which to choose 3. The room is crowded with tourists drinking beer and enjoying their 3 free glasses. Figuring that a glass of beer costs about $6 to $8, depending on where you get it, I can purchase my own three glasses of beer for $21. Let’s see, it costs me about 2 hours of time for $21 and a limited choice of beer. I will forgo the boring tour and go sit at a pizza place and get my own beer. Standing in line has never been fun, even for 3 glasses of beer. And if you taste one you do not like, you waited in line for 2 glasses of beer. And no pretzels! If you are a millennium, perhaps you have nothing better to do than give up 2 hours of your time for 3 glasses of beer. Not me or mine. I can do without the tour and I can buy my own beer. Oh, one last item. Before you leave the tasting room you are offered your photos. At a cost of course. The company wanted $25 for a package of pictures. Different backgrounds were inserted into the background. I sorta thought they should pay me for my time. I can take a selfie for pennies, why would I actually pay for a picture in a cowboy hat in front of kegs of beer? Most tour goers passed on this one. Then, of course, to get to the bus pick up location, you must wind your way through the gift shop. All in all, I would say to miss the Coors Brewery Tour. Your time is better spent in the Geology Museum at the School of Mines. I did not have to wait in line or pay an entrance fee and the information presented was complete and fascinating. And no, they did not try to sell me a glossy 8 X 10 for $25. For those of you who feel the need to take the tour, here is a one minute display of the Coors Brewery Tour. Now go to downtown Golden and have a pizza and a beer!